Dimensions: 14 3/4 x 13 3/4 in. Note: Monogram on the largest bottle, lower left. Probably added around 1860. Note: It is likely that Fanny modeled for the figure of the sleeping woman. 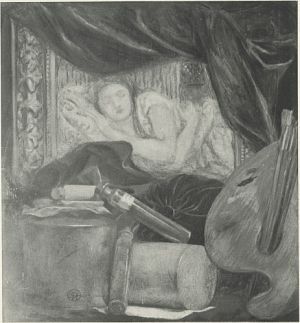 Surtees suggests that the sleeping figure may have been painted in around 1860, when the circular monogram DGR was then using, was probably added. 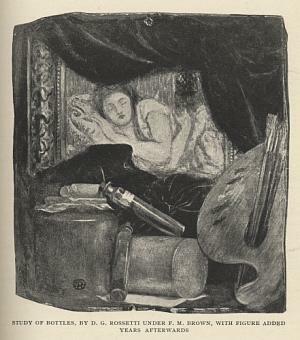 Archival History: WMR believed Madox Brown sold the painting to Herbert H. Gilchrist in 1894, whereas records in the Bancroft Collection suggest that it belonged to Fanny Cornforth until its sale in 1898. 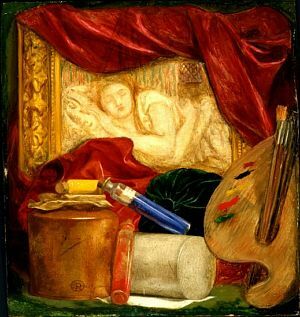 “Executed under the tutelage of Madox Brown in the early part of 1848, and probably the first attempt in oils. The older artist had set him to paint still-life, a form of drudgery much opposed by Rossetti” (Surtees, A Catalogue Raisonné , vol. 1, 7 (no. 31)). Surtees, A Catalogue Raisonné , vol. 1, 7 (no. 31). Surtees, A Catalogue Raisonné , vol. 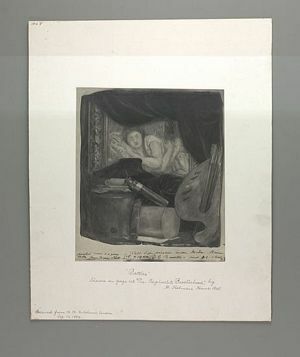 2, plate 17.